Chain rivet tool used on rivet style master links. durable construction to work on chains for off-road and street motorcycles. Different pins included to work on differing styles of rivet master links and for pushing chain pins. Designed to rivet chain links to form an endless chain such as cam and drive chains. May also be used to push pins out for breaking smaller chains. It's a handy and must have tool for any serious mechanic! Huge time saver. Works great, well built! Must have tool for a serious mechanic. This was my first chain tool with no experience. This tool worked exactly as advertised. I was nervous at first but everything in the kit was easy to use. I recommend this tool to anyone who is stepping up to doing their own chain maintenance. This tool is priced fairly. It isn't overly expensive and isn't the cheapest but the quality is excellent. This kit works really well. I had no issues riveting a 530 chain with this tool!!! This product has worked great. I’ve used it to break several chains and rivet my new one. It felt a little flimsy at first but has held up really well. It does exactly what it’s supposed to. If you do all your own maintenance like myself. Having this kit in the garage is exactly what you need ! I carry this on the trails and it saved many of beginning bike riders out on trail with snapped chains and to long of chains! Excellent product,. Ease's chain break and install, quick, strong and durable. I like the versatility of this product as well as the practicality of it. Did it's job very well. Was not entirely hefty in feel. Not sure it will last a long time. Very impressed! Great tool at a great price! Made easy work out of cutting/shortening new chain and riveting new chain in. Very impressed with quality and price! Have already recommended this to several people! 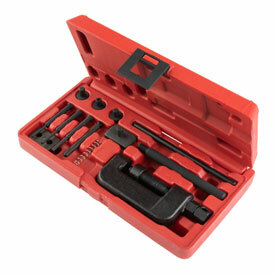 No need to spend $200 for the OEM cam chain riveting tool that you'll probably use once. This kit worked perfectly on my KTM RFS cam chain and will work on drive chains too. Don't be fooled by other people selling the same kit for more money. I have used this tool a handful of times and it helps me get the job done quickly and right the first time. Good stuff! I've used this tool multiple times with no issues. It is well built so I don't see myself buying another one for a long time. This tool makes riveting a chain very easy. I just used it for the first time to rivet a DID VT2 x-ring chain. (1st time riveting a chain). I don't know about long term or using it to break a chain. It should be ok. The Motion Pro pins are interchangeable. Tip; get a pocket caliper, $7, to measure the width of the peened pin. DID says .217 to.228 inches. Or about 5.6mm, to be sure you peen it out completely. Technically the kit is not supposed to be used on the 530 size chain. I broke the 3.8mm pin taking apart the chain using the hand tools provided. Generally disappointed in the kit. Just rebuilt the top end on my KTM and this tool made breaking and riveting the cam chain a breeze. Good quality tool and well worth the price. I don't know why it took me so long to get one of these. Life is so good now! Great quality and the price was awesome compared to other chain riveting tools. The ability to rivet my own chains is so worth it. I used this tool on my dirt bikes, quads and sport bikes. The added confidence when riding my sport bikes now is priceless. It's easy to use. Highly recommended. A must have in any tool box. Works great! I have three bikes that I maintain (mine, wife's, and daughters). I decided to rivet the master links as a nice upgrade to the drive lines. Got thru wife's bike then on my bike, the tool pushed the anvil pin thru, and in turn began pushing the master link pin out instead of riveting it. had to use other solid back pieces that were in the kit, but I had to modify them to work. So I now have two worthless parts in the kit that I will need to find replacements for. got it for a ktm 525 cam chain . doesnt rivet the link in the same fashon as the ktm tool. gets the job done but is not perfect for my aplication . Picked this up to finish the rebuild on my friends KTM. Not possible without it. Thanks Rocky Mountain atv. I think I have every tusk tool there is. I bought this chain tool to do the timing chain on my polaris outlaw 525. It did the job but after one use the pins broke. the upside is , the motion pro replacement pins will fit the tusk press. The motion pro pins cost around 6 bucks so even buying a few extra pins the cost is still better then buying the motion pro tool. I would suggest buying afew extra motion pro replacement pins when buying this tusk timing chain breaker/press. I got this tool to rivet my new 520 chain. It worked perfectly. I have not used this for breaking a chain yet so I can not say how well it works for that. I would recommend this for anyone who needs to rivet a new motorcycle chain. I found that by grinding the end off the link, it breaks the pin out with ease. I recommend sharpening the flaring tip to help prevent it from walking. Great tool for the price. It worked the first time.. I now consider this a single use product. Worked great for me the first time for splitting and pressing in a new master link on my KTM cam chain. The second time, the brittle push pin just snapped. Everything was aligned property and the guide was being used. Unfortunately the metal used for the little "breaker" pins just isn't a strong enough for repeated use in this application. a must have if you do your own chain and sprockets. i bent one of the push pins after a couple of uses but i got to give it to RMATV customer service, they had new one on the way asap. Very good quality tool. Makes installing a new chain easy! I can't believe I ever payed someone to install a chain for me... never again! been using it for a while and it still cuts and rivets like new.....cool little case too.. I bought to do a cam chain on a Husaberg that uses a split link. Just wanted to have as much insurance as possible that master link would stay together. Have used for a couple other chains since. It works good I took some time to figure out how to make it work but it does work good. used this to break the cam chain and install the masterlink on my KTM. worked perfect! Will this tool work on a 530 chain? Description does not state what size chains it works on. I bought this to use on a 2005 KTM 450 RFS timing chain and it worked great. A buddy of mine borrowed it to shorten the 520 chain on his KTM 250 and he said it worked great also. Yes, works on 520 and 530 chains. What is the difference between standard and heavy duty "size"? This tool works for bicycle chains (standard size) and motorcycle chains (heavy duty size). I hope this answer helps you out. have a great day. Heavy Duty is designed for 520 and larger chains. Standard would be for cam chains and smaller drive chains.